Mawlānā Jalāl ad-Dīn Muhammad Rūmī (1207 - 1273 C.E.) (مولانا جلال الدین محمد رومی,) known to the English-speaking world simply as Rumi, his first name Jalalu'ddin has the meaning Majesty of Religion, was a mystical thirteenth century Persian Sufi poet, jurist, and theologian. Rumi wrote over 65,000 verses of intoxicated poetry on the Sufi path of love and spiritual understanding. His ecstatic and wondrous spiritual writings left a lasting impression on Sufism, the mystical practice of Islam. His songs expressed the pain of being separated from the Beloved (Allah/God) and the joy of union with Him. Rumi's importance is considered to transcend national and ethnic borders. His poems have been translated into many of the world's languages and have appeared in various formats. The Persian world, from Turkey to India, looks upon Rumi as one of the greatest spiritual poets in history. He has had a significant influence on both Persian and Turkish literature throughout the centuries. Over the last century, Rumi’s poetry has spread from the Islamic world and into the Western world. The lyrical beauty of his outpourings of love for the Divine have also helped to make him one of the most popular and best-selling poets in America. In addition to his legacy as a poet, Rumi founded the Mevlevi Order, better known as the "Whirling Dervishes," who believe in performing their worship in the form of dance. Rumi was born in 1207 in Balkh, then a city of Greater Khorasan, Persia, in what is present-day Afghanistan, and he lived most of his life under the Seljuk Empire. He was a descendant of a family full of Islamic theologians and mystics. His father, Baha’al’din Valad, was well-respected in his community as a religious teacher. When the Mongols invaded Central Asia sometime between 1215 and 1220, the family was uprooted from their comfortable life and their home. His father set out westwards with his whole family and several disciples. On the road to Anatolia, Rumi encountered the mystic Persian poet, Attar, in the city of Nishapur, located in what is now the Iranian province of Khorāsān. Attar immediately recognized Rumi's spiritual eminence. He saw the father walking ahead of the son and said, "Here comes a sea followed by an ocean." He gave the boy his Asrarnama, a book about the entanglement of the soul in the material world. This meeting had a deep impact on the eighteen-year-old Rumi's thoughts, which later on became an inspiration for Rumi's works. From Nishapur, Baha'al'din and his entourage set out for Baghdad, meeting many of the scholars and Sufis of the city. From there they went to the Hejaz and performed the pilgrimage at Mecca. It was after this journey that most likely as a result of the invitation of Allāh ud-Dīn Key-Qobād, ruler of Anatolia, Bahauddin came to Asia Minor and finally settled in Konya in Anatolia within the westernmost territories of Seljuk Empire. His family settled in the Muslim city of Konia, in what is now Turkey. Baha'al'din became the head of a madrassa (religious school) and when he died Rumi succeeded him at the age of 25. One of Baha'al'din's students, Syed Burhanuddin Mahaqqiq, continued to train Rumi in the religious and mystical doctrines of Rumi's father. For nine years, Rumi practiced Sufism as a disciple of Burhanuddin until the latter died in 1240-1241. During this period Rumi also travelled to Damascus and is said to have spent four years there. Rumi achieved much fame in Konia, where he married, had children, and gained a following for his teaching and scholarship. At the time, he had no desire to be a poet, saying, “By Allah, I care nothing for poetry, and there is nothing worse in my eyes than that.” However, Rumi’s views would change after meeting his spiritual teacher, Shams al-Din of Tabriz. It was his encounter with the dervish Shams in the late fall of 1244 that changed his life completely. In one version, Shams interrupted Rumi in the middle of a lecture and threw Rumi’s books into a pool of water. In a similar story, Shams waved his hand over Rumi’s books, engulfing them in flames. In a third version, Rumi was riding into town on a mule with his students when a strange figure in a cloak, Shams, approached him and asked him a simple question, which he was not able to answer correctly. Each of these versions demonstrates what Shams taught Rumi, which was that book-learning was limited. Only the pursuit of divine love would lead to true enlightenment, Shams explained. It is said that Rumi spent six months with Shams learning the mysteries of the absolute and underwent a transformation palpable to those close to him and his son wrote, “After meeting Shams, my father danced all day and sang all night. He had been a scholar—he became a poet. He had been an ascetic—he became drunk with love.”  Thus, at the age of 37, Rumi changed from the sober intellectual into the ecstatic Sufi follower from whom poetry flowed. Rumi's love and his bereavement for the death of Shams found their expression in an outpouring of music, dance and lyric poems. Rumi's works express mystical odes and lore and longing for the experience of the divine. His most seminal texts are the Diwan-I Shams-I Tabriz, the Rubaiyat and the the Masnawi (also called Masnavi-ye Manavi). 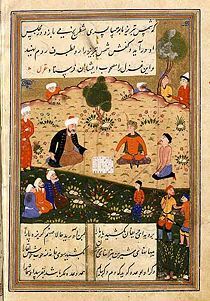 The Masnavi-ye Manavi (Spiritual Couplets) is a six-volume poem regarded by many Sufis as second in importance only to the Qur'an. In fact, the Masnawi is often called the Qur'an-e Parsi (The Persian Qur'an). It is considered by many to be one of the greatest works of mystical poetry. Rumi's other major work is the Diwan-e Shams-e Tabriz-i (The Works of Shams of Tabriz - named in honor of Rumi's great friend and inspiration), comprising some 40,000 verses. Several reasons have been offered for Rumi's decision to name his masterpiece after Shams. Some argue that since Rumi would not have been a poet without Shams, it is apt that the collection be named after him. Others have suggested that at the end, Rumi became Shams, hence the collection is truly of Shams speaking through Rumi. Both works are among the most significant in all of Persian literature. Shams is believed to have been murdered by disciples of Rumi who were jealous of his relationship with Shams. His poetry is often further divided into various categories: the quatrains (rubaiyat) and odes (ghazals) of the Divan, the discourses, the letters, and the almost unknown Six Sermons. A secondary source of Rumi's writings is the Fihi Ma Fih, composed of Rumi's speeches on different subjects. Rumi himself did not prepare or write these discourses. They were recorded either by his son Sultan Valad or some other disciple, and put together as a book. The title has been translated as, "What's in the Mathnawi is in this too." Some of the discourses are addressed to Muin al-Din Parvane.. Some portions of it are commentary on Masnavi. Another writing is the Majalis-i Sab'a (seven sessions), which contains seven sermons given in seven different assemblies. As Aflaki relates, after Sham-i Tabrizi, Rumi gave sermons at the request of notables, especially Salah al-Din Zarqubi. A page of a copy circa 1503 of the "Diwan-e Shams-e Tabriz-i"
When it calls you, you’ll tell its tale. Made us lovers one of another. So that each may perfect the other’s work. So the world may subsist through their union. Rumi considers all love to be, in reality, the divine love for Allah. Although people love one another and beautiful objects of the world, these are only reflections of the Beloved and as such, are a distraction from the truth. When people leave this world and see the Eternal King without these veils, they will know that all these were veils and coverings and that the object of their desire was in reality that One Thing. Then you fill them with gold to the tops of their heads. Along with anticipation and anguish, the dance of the whirling dervish symbolizes the exhilaration that comes from the search for divine love. Through his whirling and dancing to the sounds of a longing reed and an insistent drum, Rumi attempted to transcend his body and rational consciousness. But the Sufi is hidden. Oh Moslems, who ever has seen a cloak dance without a body in it? Thus, Rumi expressed how his whirling was part of the universal cosmic dance that was begun and sustained by the divine music of love. Much of his intoxicated and spontaneous poetry was borne through the ecstasy of his dance. Rumi died on December 17, 1273 in Konia. He was laid to rest beside his father where his followers erected a shrine over his remains. The thirteenth-century Mevlana mausoleum, which also has a mosque, dance hall, dervish living quarters and school, continues to draw pilgrims from across the world. Rumi’s writings and poetry remain exceedingly popular in both the Islamic world and the Western world. One explanation for Rumi’s popularity may be that his poetry embraces all cultures, nationalities and mythologies. People can read the poetry of Rumi without feeling as though he is imposing any orthodox belief upon them. 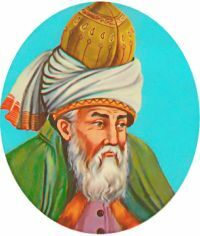 Of course, Rumi considers himself first and foremost to be a Muslim in search for the divine, writing, “I am the slave of the Koran, While I still have life,”  Yet although he dedicates himself to Islam and the Sufi tradition, Rumi integrates themes and myths from multiple religious traditions into a universal expression of Divine Love. His writings resounded with tolerance, goodness, charity and awareness through love. According to Shahram Shiva, one reason for Rumi's popularity is that "Rumi is able to verbalize the highly personal and often confusing world of personal/spiritual growth and mysticism in a very forward and direct fashion. He does not offend anyone, and he includes everyone. The world of Rumi is neither exclusively the world of a Sufi, nor the world of a Hindu, nor a Jew, nor a Christian; it is the highest state of a human being—a fully evolved human. A complete human is not bound by cultural limitations; he touches every one of us. Today Rumi's poems can be heard in churches, synagogues, Zen monasteries, as well as in the downtown New York art/performance/music scene." At Rumi’s grand funeral procession Jews, Christians, Muslims, Hindus, Buddhists, and Sufis cried and mourned in a manner that one would have thought that Rumi belonged to each one of them. Rumi’s visions, words, and life teach us how to reach inner peace and happiness so we can finally stop the continual stream of hostility and hatred and achieve true global peace and harmony. ↑ BestIrantravel, "Persian Poets." Retrieved September 18, 2017. ↑ Coleman Bank, Rumi: The Book of Love: Poems of Ecstasy and Longing (HarperCollins, 2005, ISBN 0060750502), xxv. ↑ Nazeer Ahmed, Islam in Global History: From the Death of Prophet Muhammed to the First World War (Xlibris Corporation, 2001, ISBN 0738859621), 58. ↑ 4.0 4.1 4.2 4.3 4.4 4.5 4.6 C. Tell, "A poet and a mystic: Jalaluddin Rumi." Social Education 66, (2002): 204–210. ↑ 6.0 6.1 6.2 6.3 A. El-Zein, "Spiritual consumption in the United States: the Rumi phenomenon." Spiritual Islam and Christian-Muslim Relations 11 (2000), 71–86. ↑ Abdin Chande, "Symbolism and allegory in the Qur'an: Muhammad Asad's modernist translation." Islam and Christian-Muslim Relations 15(1) (2004). ↑ Metin And, "The Mevlana Ceremony" The Drama Review: TDR The Annual Performance Issue: 21 (3) (September 1977), 83-94. ↑ 11.0 11.1 A. Omaima, "Abrogation of the mind in the Poetry of Jalal al-Din Rumi." Alif: Journal of Comparative Poetics, 14 (1994), 37-63. ↑ Khamush, "Life of Rumi" Retrieved September 18, 2017. ↑ Burak Sensal, "All About Turkey." Retrieved September 18, 2017. ↑ Niels Mayer, "Whirling Dervishes" Retrieved September 18, 2017. ↑ Jonathan Curiel, "Islamic verses: The influence of Muslim literature in the United States has grown stronger since the Sept. 11 attacks" San Francisco Chronicle, February 6, 2005. Retrieved September 18, 2017. ↑ Shahram Shiva, Rumi Network. Retrieved September 18, 2017. Chittick, W. C. Sufism—A Short Introduction, Oxford, UK: One World, 2000. El-Zein, A. "Spiritual consumption in the United States: the Rumi phenomenon." Spiritual Islam and Christian-Muslim Relations 11, (2000), 71–86. Loutfy, N., and G. Berguno, "The Existential Thoughts of the Sufis." Journal of the Society for Existential Analysis 16 (2005), 144–155. Omaima, A. "Abrogation of the mind in the Poetry of Jalal al-Din Rumi." Alif: Journal of Comparative Poetics, 14, 37-63. Redhouse, James W. The Mesnevi of Mevlānā Jelālu'd-dīn er-Rūmī. London: 1881. Rumi. The Masnavī by Jalālu'd-din Rūmī. Book II, translated for the first time from the Persian into prose, with a Commentary, by C. E. Wilson, London: 1910. Rumi. The Mathnawí of Jalálu'ddín Rúmí, edited from the oldest manuscripts available, with critical notes, translation and commentary by Reynold A. Nicholson, in 8 volumes, London: Messrs Luzac & Co., 1925–1940. Contains the text in Persian. First complete English translation of the Mathnawí. Rumi. Rending The Veil: Literal and Poetic Translations of Rumi. translated by Shahram Shiva Hohm Press, 1995. ISBN 0934252467. Recipient of Benjamin Franklin Award. Safavi, Seyed G. (ed.) Rumi's Thoughts. London: London Academy of Iranian Studies, 2003. Tell, C. "A poet and a mystic: Jalaluddin Rumi." Social Education 66, (2002), 204–210. Whinfield, E. H. (trans.) Masnaví-i Ma'naví, the Spiritual Couplets of Mauláná Jalálu'd-din Muhammad Rúmí. (first published in London: 1887) 1989. Abridged version from the complete poem. On-line edition at sacred-texts.com (1898) Retrieved September 18, 2017. All links retrieved September 16, 2017. Nihat Tsolak (editor) "Jalaluddin Rumi" Khamush poetry of Rumi in translation. The Mevlevi Order of America. This page was last modified on 27 September 2017, at 18:08.